Atlas Wire is a high-quality manufacturer of Military Wire. We manufacture military hookup wire for internal wiring of electronic components and electrical equipment. Atlas Wire extrudes plastic and nylon insulations over a wide variety of choices in conductor, including bare copper, tinned copper, prebond copper, overcoat copper, or topcoat copper constructions. Our PVC insulation is RoHS Compliant and REACH Compliant . Our quality system is registered to the ISO 9001 Standard and the TS16949 Standard. Our Military Wire is made to specific military requirements for use in systems operating in an environment from -54c to 105c. Our Military Wire is intended for use in lead wire and internal wiring of electrical and electronic equipment, internal wiring of meters and internal wiring of electric panels. 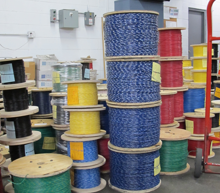 Atlas Wire is a premier provider of Military Wire. Contact our Illinois Office at (847) 678-1210 or our Arizona Office at (520) 747-4500 or Send Us a Message to see how we can serve your needs for Military Wire. Click on a product subcategory below to view our military wire selection.